As Jilienne mentioned, we just got back from back-to-back business trips. 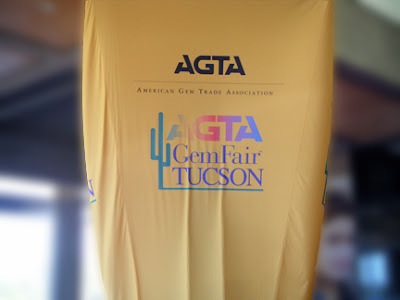 Our first stop was Tucson, to shop at the annual Gem & Mineral Show. This is a sprawling show that takes over Tucson for the first couple weeks of February each year; it’s usually a lot of fun, but also overwhelming. I always go with my list of Needs, and then open myself up to be "wowed" or "inspired"… to see something that’s new to me. Sometimes it is not necessarily new to the industry, but just hits me as “right”; other times it is so new that I can only find a little bit of the stone and the next year it floods the market! (This has happened to me several times.) I also get very enticed by certain stones that end up sitting in my vault for years, crying out for me to use them. (A few times, these vaulted stones turned out to be the next big trend, which I missed because I didn't get around to making the new design.) I usually try not to follow trends; I prefer to close my eyes and follow my heart. That is why it is funny to me when someone says, "I see you are using a lot of 18k Pink gold. Is that in?" I laugh and say, "I have always used a lot of 18k Pink Gold. The rest of the world is just now catching up!" This happened with the Copper Rutile (a very special Quartz) that I use too! I am very picky about which colors I like to use, and I tend to make myself mad trying to find the right shade of gemstone. Last year, I fell in love with Grey (Grey Quartz and Rough Grey Diamonds,) but it had to be that perfect light charcoal color that looks amazing with my Crushed Melange (tri-color) Collection. This year, everything looked the same to me… nothing was calling out, “Pamela! Make something with me!” (with the exception of bi-color Tourmaline, which I always love but rarely use.) By the third day of walking the Show, I was getting a little depressed… even though I’d found some beautiful rough cut diamonds, I still hadn’t found my Wow! Stone. And then it hit me, (Wham!) from two different directions! Iridescent Milky Diamonds, and Platinum Rutile! My mind has been waking me up in the middle of the night to draw and sculpt new shapes to go with these fabulous stones! This particular Rutile is very rare -- I can only get it from one mine in Brazil, and everything they mined is already carved, so I can’t get matching stones for earrings -- but I can make rings, necklaces and bracelets and it is soooo cool. It looks great with all of my metal colors! It is very specific, and not for everyone, but I absolutely love it!! The Milky Diamonds will probably become a bridal-ish ring group (yes I wrote “bridal-ish”) because I think they’ll make great right-hand-rings, but a cool bride would love to wear one as her wedding ring. I can't wait to show all of you what I do with my new stones! We're back in Los Angeles, so I think I'll be able to get back into my 1-2 blog/week routine. I finally installed the software for my new camera (a cute Fuji point-n-shoot digital from my very thoughtful Valentine), so I'll upload the pics from Tucson and Philly very soon. Also, Pamela told me she'd like to write about how the annual Tucson trip inspires her new designs! Be sure to check back, because you'll definitely want to read a post from the creative mind behind Pamela Froman Fine Jewlery! I apologize for going so long between posts; Pamela and I were preparing for back-to-back business trips, and I just could not seem to find the time to post a new blog! The first trip was to Tucson, for the annual Gem and Mineral Show. This is where Pamela finds most of the rare and beautiful gemstones that complement and inspire her designs. (By the way, I took a few pictures while we were there, which I plan to upload for you sometime this week.) We just got back to L.A. last night, and we leave again tomorrow, this time for Philadelphia; Pamela will be exhibiting her colletion there, at a trade show called "globalDESIGN". I'll go into more detail later, but for now I need to do a little laundry and re-pack. 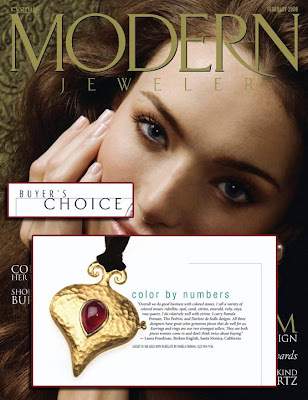 Pamela's one-of-a-kind "Sentimental Crush" Locket recently appeared in the Buyer's Choice section of Modern Jeweler magazine. This is the first in a series of unique lockets that Pamela has designed. This locket is 18k Yellow Crushed Gold (with an 18k White Crushed Gold inset in the back) and a beautiful pear-shaped Rubellite cabachon, shown on Italian Lambskin Leather Ribbon. P.S. 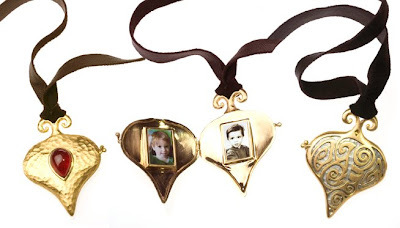 In case you're wondering who the cutie in the locket is... it's Pamela's favorite creation, her son Hudson.